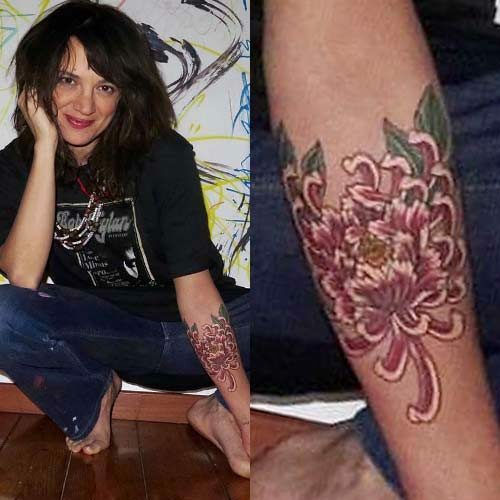 Asia Argento has a new tattoo on her left forearm “V for Verdade” – a new flower. Mixed with peony and chrysanthemum. Asia Argento got a tattoo of a peony on her inner thigh in May 2016. This full-color traditional tattoo is a different style than most of her ink, so she went to a different artist: Tokyo-based tattooer Akilla who specializes in traditional Japanese style tattoos. 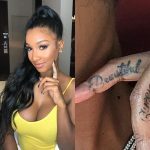 She traded tattoos with the artist, giving him a small tattoo on the back of his wrist. 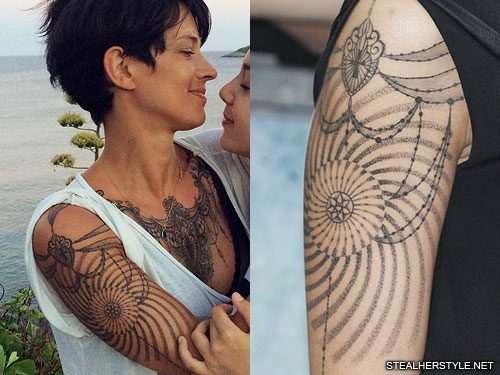 Asia Argento has a “Warrior Mermaid” full back tattoo with three lotus flowers, a heart at the bottom, and lots of swirls and geometric patterns. The custom design was drawn by Francesca Boni and tattooed by Marco Manzo in January 2016. It represents a shield of armor. 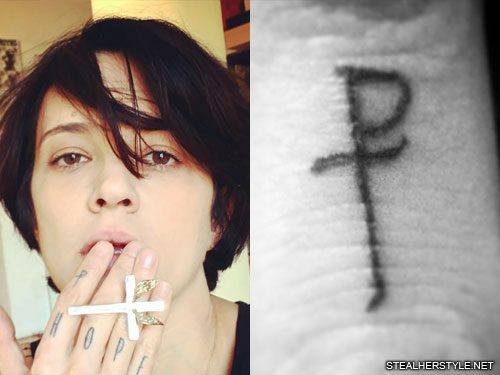 Asia Argento got rid of the old “Panos” tattoo on her left wrist with laser tattoo removal. 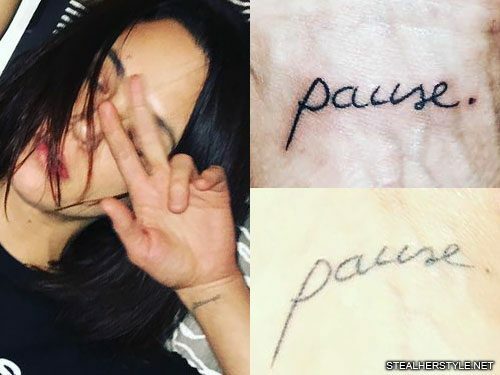 She had it replaced with a new tattoo that says “Pause” in delicate cursive letters on December 31, 2015 to commit herself to her new year’s resolution of pausing to experience the present moment. 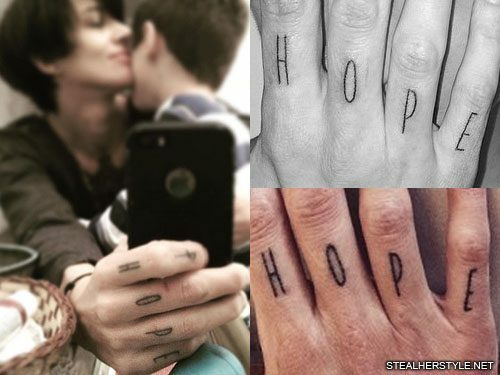 Asia Argento got her left upper arm tattooed shortly after the right in May 2015. The ornamental designs on her chest and both arms are all the creations off Marco Manzo and Francesca Boni. “Thank you for making me one of your living canvases #Respect #admiration,” she writes. The beads and shield on the top of both shoulders are the same, but the left arm has a spiral mandala design. 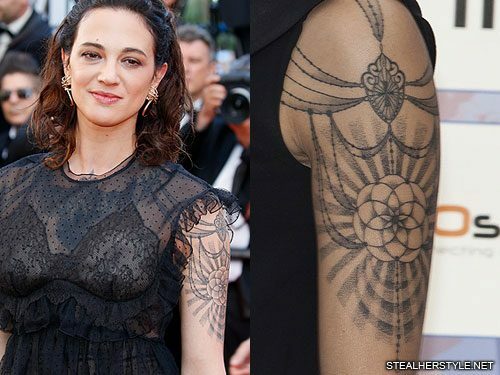 Artist Marco Manzo expanded Asia Argento’s ornamental jewelry tattoo onto her left arm in May 2015. 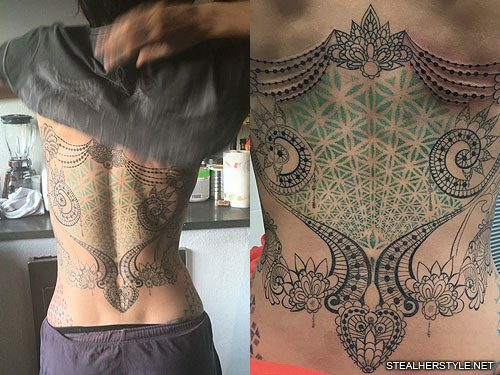 He created a dotwork mandala design and placed strands of beads across her shoulder to connect it to to her existing chest piece. When I was a child I spoke as a child, I understood as a child, I thought as a child, but when I became a man I put away childish things. For now we see in a mirror, dimly, but then face to face. Now I know in part, but then I shall know just as I am also known. And now abide faith, hope, love, these three; but the greatest of these is love. 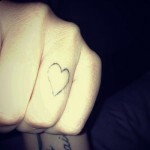 In December 2014, Asia Argento got this knuckle tattoo of the Staurogram (⳨). 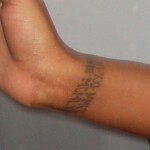 It is a Greek Christian symbol made of the letters tau and rho. 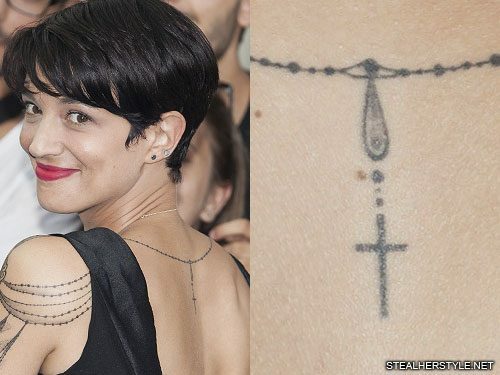 Asia Argento got this cross necklace tattooed on her back in June 2014. It is attached to the intricate design on her chest and was done by the same artist, Marco Manzo. Asia Argento has an ornamental chest piece which is inspired by Victorian necklaces. The design was drawn by Francesca Boni and tattooed by Marco Manzo at the International Tattoo Expo Roma in May 2014. The intricate piece took over 25 hours to tattoo and won the award for Best Ornamental Tattoo.